In the past 25 years, the distribution of income and wealth in Britain and the US has grown enormously unequal, far more so than in other advanced countries. The book, which is aimed at both an academic and a general audience, examines how this happened, starting with the economic shocks of the 1970s and the neo-liberal policies first applied under Thatcher and Reagan. In essence, growing inequality and economic instability is seen as driven by a US-style model of free-market capitalism that is increasingly deregulated and dominated by the financial sector. Using a wealth of examples and empirical data, the book explores the social costs entailed by relative deprivation and widespread income insecurity, costs which affect not just the poor but now reach well into the middle classes. Uniquely, the author shows how inequality, changing consumption patterns and global financial turbulence are interlinked. The view that growing inequality is an inevitable consequence of globalisation and that public finances must be squeezed is firmly rejected. Instead, it is argued that advanced economies need more progressive taxation to dampen fluctuations and to fund higher levels of social provision, taking the Nordic countries as exemplary. The broad political goal should be to return within a generation to the lower degree of income inequality which prevailed in Britain and the US during the years of post-war prosperity. George Irvin is Professorial Research Fellow at SOAS, University of London. 1 Neo-liberalism and the Return of Inequality. 2 Do we need Fat Cats?. 3 The Rise of Neo-liberalism. 4 America, Europe and the Welfare State. 6 What about the middle class?. 7 The Growing Cost of Inequality. 8 Is the Consumption Binge sustainable?. 9 In Defence of Equality. "Could not be more timely ... Irvin's book provides much food for thought, bringing together a huge amount of evidence on the changing nature of income distribution and its impacts on society." "Irvin's book is timely and prescient. His analysis is thorough and strongly supported with statistics, his support for a Nordic model welfare state is eminently sensible and his defence of an ideal of equality passionate." "Will be of interest to anyone with a concern for inequality. The book details uncomfortable home truths about economic inequality and has many real-life examples which make for important reading." "Super Rich discusses a truly real issue in today's western economies and offers many intriguing insights, highly recommended." "Last week the Dow tumbled below 10,000 and kept right on falling. George Irvin explains what happened in his most timely new book, Super Rich. With clarity and empathy ... he traces a transatlantic tale of times good and then greedy." "During the last 25 years the economic and political histories of Britain and the United States have shared many features; among these is the prodigious enrichment of a small super rich minority on the one hand, and the persistence of serious poverty on the other. Irvin utilizes an impressively wide range of sources of data and analysis to provide a provocative, enlightening and accessible account of the growth of economic unjustice. This book should both generate heated debate and provoke action." "The seemingly inexorable rise of inequality of income and wealth is the social equivalent of global warming – except that it is happening much more in some societies, notably the US and the UK, than others, notably the Nordics. George Irvin provides a fascinating account of the causes and the consequences of growing inequality; and at the end a plausible agenda of public policy to curb the rise without generating harmful societal side-effects. He writes from a distinctly Left perspective; but unlike a lot of Left writing the English here is accessible to the general reader, with interesting facts and stories on every page. It is particularly recommended for politicians and economists who declare that they are concerned about poverty but not inequality, and for the police, MI5 and the FBI who have to handle the consequences of inequality-driven social distrust and unrest." 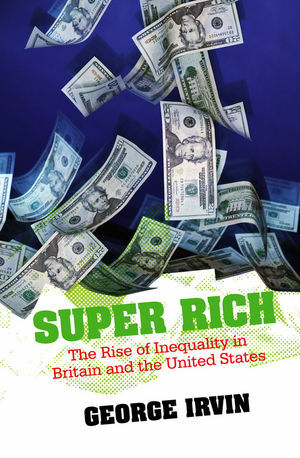 This lively and engaging book examines the nature of inequality in Britain and the United States. Irvin uses a wide range of sources and examples to illustrate his arguments and draws on his wealth of knowledge to explore the social costs of growing inequality. Super Rich offers an original view of inequality by showing how inequality, changing consumption patterns and global finance are interlinked. This book will be widely appreciated by both a general and an academic audience, and is written in an engaging and accessible style.